Big Cartel – is a powerful eCommerce website builder, which is designed for artists, photographers, painters and other representatives of creative professions and small businesses. The system supports independent entrepreneurs in their attempts to effectively present and sell their products and works of art. It is basically meant for those users, who have created a unique and one-of-a-kind product and are looking for simple ways to sell it to the target audience. Founded in 2005, Big Cartel has one serious goal – to help its developer, Matt Wigham, find the best ways to sell his band merchandise on the web. Since that time, the website builder gradually developed into one of the most powerful and world-known eCommerce systems in the world. The website builder is now a feature-rich, full-hosted software, which allows creating projects, in which the design simplicity harmoniously merges with functionality, affordability and convenience. Big Cartel designers underline that they “believe in the artist” and this is the fact that best describes the goal and the major implication of the system. So, if you are an independent artist willing to start selling online, it’s high time to discover the major characteristics and features of the website builder. Easy and simple store builder. Big Cartel markets itself as a convenient, intuitive and easy-to-use eCommerce solution for those, who intend to sell their works in the global network with minimum effort investment. Launching a web store with the system is simple and fun, which matters a lot for newbies. Having completed an easy sign up procedure, you’ll be redirected to the admin panel, providing myriads of options. 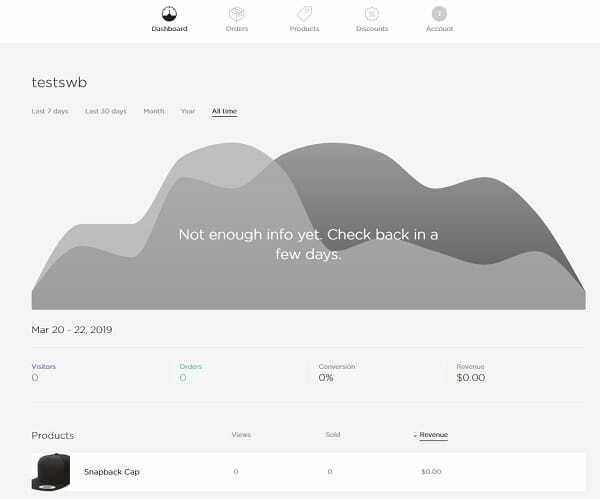 This is where you’ll be able to fill out your account, browse and set up shop essentials (add products, pick and customize a template, adjust payment and checkout options) as well as get access to premium features offered for paid plan users (add discounts, custom domain name, enable inventory tracking etc.). Big Cartel admin panel also grants access to the Dashboard, Orders, Products and Discounts sections. They are available all in one place here. Just pick the section you’d like to customize and start working on your web store development. By the way, a handy process completion bar will help you track the percentage of successfully accomplished web store set up process. The higher it is – the better your website is prepared for publication. The very process of web store development is not complex as well. While you’ll be busy customizing your website, the system will automatically generate handy tips, hints, suggestions, reminders and prompts on how to maximize the result. Just stick to the guidelines to get decent result! All in all, Big Cartel contributes to perfect visual presentation of your eCommerce project without requiring any coding skills form you. However, if you decide that you need deeper flexibility and more advanced functionality, you won’t go without using programming knowledge anyway. Convenient dashboard and admin panel. Easy to use storefront editor. Big Cartel positions itself as a one-of-a-kind eCommerce tool that makes it possible to launch, manage and update a web store all in one place. You won’t be confused by the complicated interface or multiple web design tools – the choice is pretty limited yet clear and understandable from the very first sight even to those users, who have never been involved in website development before. Such simplicity is explained by the fact that the website builder mainly works well for small online stores with around fifty unique products offered for sale. This is what makes Big Cartel a top choice for independent artists and entrepreneurs, who don’t wish to face all the hassle of the web design process and expect to avail great result within the shortest time possible. Big Cartel Dashboard grants access to product uploading, customer checkout, order management and discount creation sections. The latter section, however, is available only for paid plan users. Anyway, you won’t get lost here – so understandable Big Cartel features are. Let’s have a closer look at them now. Product management tools make it possible to track the inventory and product assortment you have in stock. This is how you will be sure that you will not accidentally run out of products customers may be looking for. It’s also possible to to mark items as “sold out” or “coming soon” to notify users about the upcoming product assortment updates. Adding products is extremely easy here. What you need is to add the image of item you wish to offer for sale, specify its name, price, category, status, add the description and set up shipping parameters. These steps should be applied to each product you plan to add. In case you are going to sell digital (not physical) products, the system allows integrating with Pulley to conveniently list them. The system also provides an opportunity to export/import products from CSV files to cut down the time needed to create and manage product galleries. All in all, the entire process of product uploading won’t take it long – so precise and easy it is. One of the downsides of the platform is that there is no Abandoned Shopping Cart Recovery option here. Meanwhile, many contemporary users value this feature a lot as it may be rightfully considered one of the major customer generation tools that affect sales growth amount. When it comes to order management, Big Cartel lets you see the entire list of orders in a separate section. 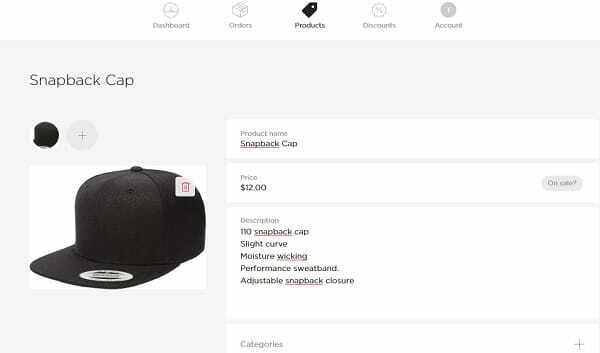 This is where you’ll be able to track orders and their statuses, set up confirmation emails to send them to customers completing the purchases in the automated mode. The discount section, in its turn, lets premium plan users create discount offers to drive customer attention and encourage them to deal with you on a regular basis. This correspondingly contributes to customer base growth. To keep track of your web store performance and to be able to analyze the major factors that might have positive/negative impact on this parameters, you can use Google Analytics, which is integrated into the platform by default and can be used by paid plan subscribers only. One of the highlights of the website builder is that there is no customer login option here. Instead, there is a guest checkout option for new customers. This means that users, who wish to buy something from you, are not obliged to create an account to start shopping. This appeals to most customers, who value their time and convenience above all. Big Cartel offers social integration options to let you quickly and effectively sell via Facebook and Instagram. This feature is available both for free and paid plan users. What’s more, the system can boast the availability of multiple integrations and add-ons. Among the popular extensions you can add to your Big Cartel web store, it initially makes sense to mention Zapier, (which additionally grants access to more than 1000 apps), Google Domains, LiveChat, Lucky Orange, MailChimp, Printful, Art of Where, ShipRobot, ShipRush, Socialphotos, ShipStation, Big Cartel for iOS. Additionally, the system offers the API that makes integration with external software simpler and more convenient. Speaking about payment options, there are no many of them in Big Cartel. The choice of payment tools is pretty limited and goes down to three options only. These include Stripe, PayPal and Square. You can keep track of all the transactions and order details in the corresponding Order section available in the admin panel. What’s important, Big Cartel doesn’t charge any additional fees for payments made with the system. See also: Best eCommerce Website Builders Reviewed. 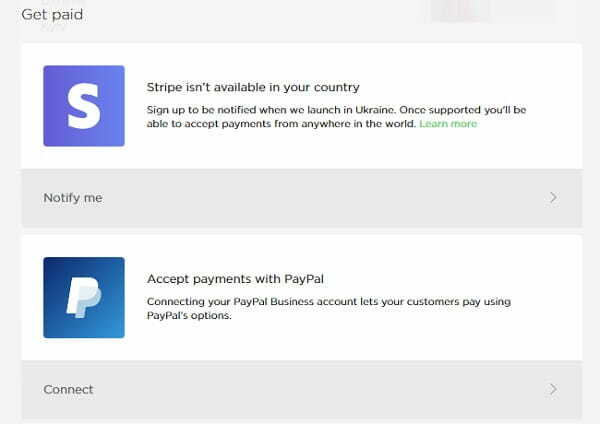 Stripe and PayPal payment options. Big Cartel is a WYSIWYG website builder, which lets you see and control all the edits you make on a web page in the real-time mode. This is a must-have feature for systems that are focused on the needs of users, who have no preliminary web design background. 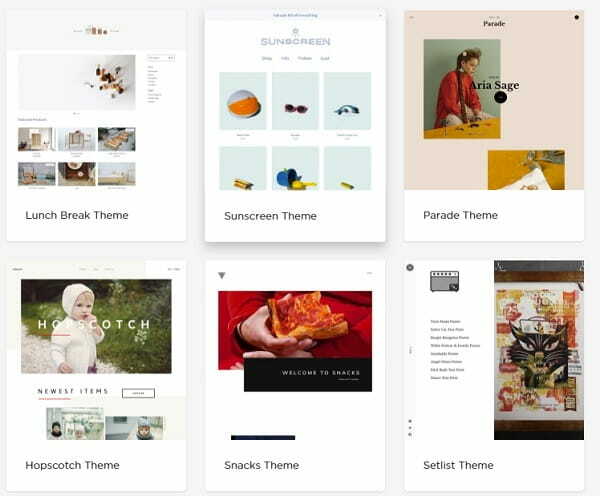 As of today, the website builder offers 16 themes available in the gallery by default. All of them look professional, neat and clear, but let’s face it: this number is not enough to cover all the variety of needs of contemporary eCommerce website owners. Prior to selecting the design, you can preview it to explore the details. What’s important, you can switch the template while working on your website development, if you realize that it doesn’t meet your needs or niche specialization. Your content will be automatically re-formatted to fit the new theme. Big Cartel templates are fully responsive – whatever design you will go for, it will fit tablet, desktop and mobile screens to ensure the unsurpassed web browsing experience. As you start customizing the chosen template, you are provided with the list of features to be edited in the left bar of the dashboard. What you can edit and set up here is header image, background image (primary and secondary), slideshow, links, text, product background rollover, borders, buttons, inventory bars etc. You can also set up fonts, announcement text, navigation items, the number of featured products and maximum products per row, product list info, the number of products per page, price display, social network URLs (Twitter, Facebook, Tumblr, Instagram, Pinterest) and more. Unlike its popular competitors like Shopify or BigCommerce, Big Cartel doesn’t have an integrated image editor. The only way to edit photos prior to adding them to product descriptions is to manually edit the code, which requires corresponding programming knowledge. Likewise, the website builder doesn’t have stock images and clipart, which triggers the need to upload images on your own. Another thing you should know about Big Cartel template customization is that the themes are quite restrictive and do not allow for creative freedom. There are too little items you can change in the templates. If you are not satisfied with the way the selected theme looks, you won’t go without using coding skills to customize them as you wish. That’s a notable demerit for non-techies. Big Cartel cannot boast powerful customer support. There is a blog at the website, where you can look through the niche-related articles, news and community recommendations. What’s more, you can reach the Help Center – the extensive Knowledge Base of the system, which is quite easy to navigate and logically-structured. Is there still anything you haven’t managed to find in the Knowledge Base? Then there is an opportunity to get in touch with a friendly support team of the service via email. This is possible during working hours on weekdays. All in all, Big Cartel customer support is quality, but not quite feature-rich. Big Cartel has four paid plans you can browse to create a full-featured website that corresponds to your particular eCommerce web building needs. These include Platinum, Diamond and Titanium Plans. Their cost constitutes $9.99/mo, $19.99/mo and $29.99/mo. ✓ Sell online and in person. The price of each plan depends upon the feature set, services and tools provided. This concerns the number of products to be uploaded, customization options, inventory and statistics tracking options, template choice and what not. If you feel the need to test drive the system prior to upgrading to one of the paid subscriptions, Big Cartel lets you try the free Gold Plan, which is, however, limited in features provided. Thus, a free plan lets you add not more than 5 products and it doesn’t allow to create discounts as well as to use some other features available for paid plan users. Every plan includes all set of options. Cheaper in compare with others. Big Cartel is undoubtedly one of the most trusted representatives of the eCommerce niche. However, it comes with a list of pros and cons, which may have notable impact upon the users’ decision regarding the choice of the system. That’s why, it makes sense to enlist the merits and demerits of the website builder below. Promocodes and discounts are included. Easy to start from scratch. Big Cartel is quite a powerful yet controversial website builder, which is a great choice for creatives, artists, musicians, small merchants and all those users, who create their own products and wish to sell them online. The system is geared towards people, who are not professionally involved in web design and are looking for a platform to reach the target audience and to be able to present their works in the most favorable light. The system stands out from the crowd due to its intuitive and logically-structured dashboard, which gives clear understanding of how the web design process should be completed. At the same time, the website builder lacks design customization options and comes with a limited template choice. If you need to launch an outstanding web store, you just won’t be able to go without coding knowledge. Big Cartel sales and marketing features are enough to build and support a small online store. If you have an intention to grow your business in future and add more products to the catalogue, then it makes sense to look for a better alternative. Fortunately, there are many decent website builders that can effectively be used to launch and manage a full-featured eCommerce website.